Have you ever wondered about the term "School of Arts"? If so, you are not alone. As a kid I thought the Bulimba School of Arts was a place where one went to study painting. You probably could do that in some of them, but their original purpose was to be the focal point of the community - as a meeting place, as a library, as a learning centre. Mechanics' Institutes provided a similar purpose, and we have previously looked at the South Brisbane Mechanics' Institute that was to become the South Brisbane Library. Australia's first Mechanics' Institute was formed in Hobart in 1827, right around the time Moreton Bay penal settlement, the forerunner of Brisbane, was being established. 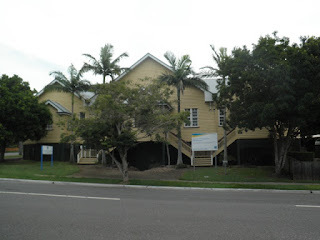 It was not until 1851 that Brisbane saw its own School of Arts established in a building on the corner of Queen and Creek Streets, and it moved subsequently to the well-known building in Ann St.
As new districts and suburbs emerged, many built their own School of Arts for the same reasons. 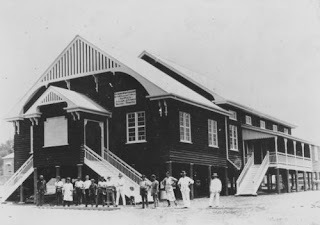 Today we are looking at one of them - the Wynnum School of Arts which was built on Bay Terrace in 1913. Here is a photograph made just after its completion, and it includes the workmen from the project. And I'm pleased to say that the building remains and still performs some of its original functions. I have very vague memories of it as Wynnum Library, just before the recently closed library on Bay Terrace replaced it in 1977. Many thanks. I loved examining the history of Mechanics' Institutes in Britain and Australia and have visited the remaining ones throughout the Victorian countryside, including Ballarat. What was important about this post was drawing a link between adult education at the Mechanics' Institutes and Brisbane's Schools of Arts. Presumably the Schools of Arts were more expensive to attend and more professional on behalf of their students and graduates.